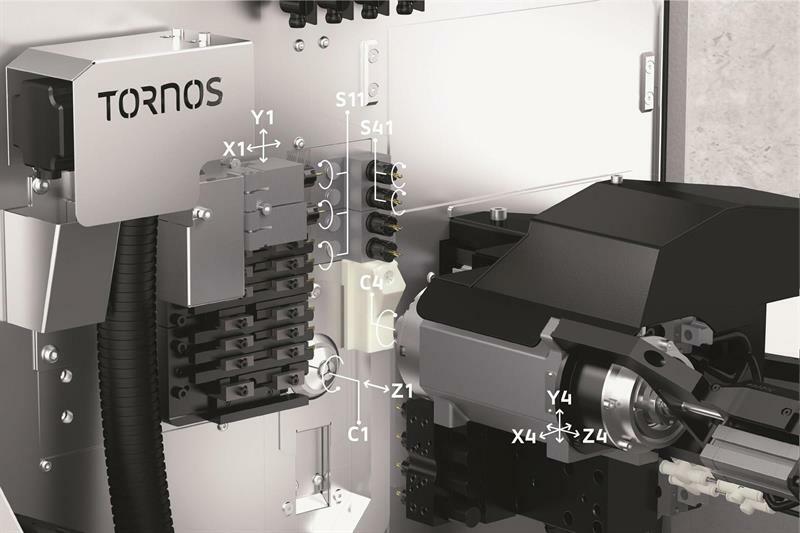 ​Tornos has now extended its SwissNano line of micro turning centres with the arrival of the 7 mm bar capacity SwisNano 7. The SwissNano 7 retains the advantages of the 4 mm version, the kinematics and the excellent thermal stability, said to “deliver unrivalled performance and precision”. The original machining capacity of 4 by 28 mm has been boosted to 7 by 50 mm and the spindle power more than doubled to 2.5 kW to enable the machine to process bars made from the hardest of materials. The machining area has been re-designed and the available tooling expanded and optimised to enable numerous operations providing high added value. The small footprint and machine design means SwissNano 7 occupies the same space as a cam-type machine and so can increase output per unit area, compared to other CNC machines. The 6-axis kinematics offer numerical adjustment of all tool positions in X, Y and Z directions. At the heart of the concept is the back spindle, mounted on three linear axes, making “the machine extremely user friendly”. The main platen includes three positions for the rotating tools; it can hold transverse drills, a polygon tool or a gear hobbing tool. This opens up the possibility of machining operations not previously possible on this range. The machine is ideal for the medical sector with the addition of a thread-whirling unit. For instance, it enables the machine to be used for the production of maxillofacial screws. In addition, it is an excellent partner when it comes to the production of screws for dental implants or straight implants. The machine can also be equipped with high frequency spindles for back machining operations. This permits the machine to mill hexalobular shapes (Torx). The SwissNano 7 is also perfect for machining of connectors. It can be equipped with a slotting unit for back machining that enables split connectors to be tackled from both sides. Moreover, a polygon cutter can be installed for both main and back machining operations. The machine also enables processes such as gear cutting to be performed during main and back machining operations. In addition to the two main tool systems, the machine is equipped with a tool holder under the counter-spindle. This enables front drilling operations to be done or it can even support the workpiece during the machining process.